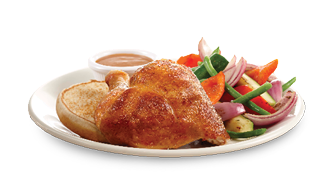 We select superior quality 100% Quebec chicken, seasoned with our Scores chicken spice blend. We slowly rotate it on a spit to bring out all the natural juices. 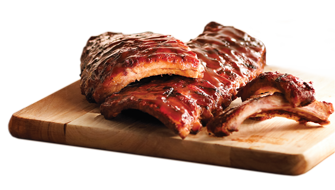 The mouth-watering result is what we are famous for! 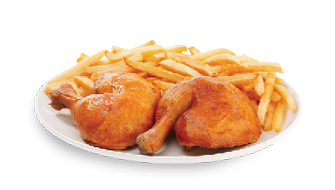 Most of our dishes are served with a choice of side: fries, baked potatoe, mashed potatoes, basmati rice, Scores rice or roasted vegetables. 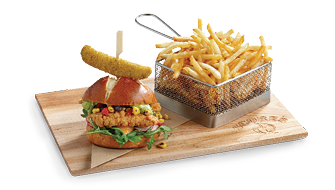 Our burgers are served with coleslaw and a choice of side: fries, baked potatoe, mashed potatoes, basmati rice, Scores rice or roasted vegetables. 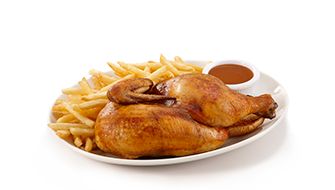 All kids meals include the soup, salad and fruit bar, a choice of accompaniment*: mashed potato, baked potato , roasted vegetables, basmati rice, Scores rice or French fries, a choice of beverage and dessert. *With the exception of the teeny Tortellini. *If you are gluten sensitive, please see your location for details. 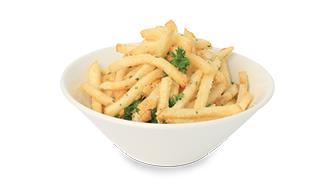 Dive into our hand tossed fries with garlic and parmesan. 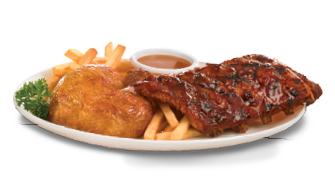 Produced in Quebec, served with a choice of sauce: spicy wings, honey-Dijon ribs, or General Tao. 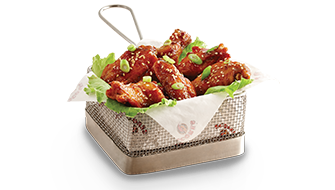 Get your wings tossed in the sauce if your desire to. 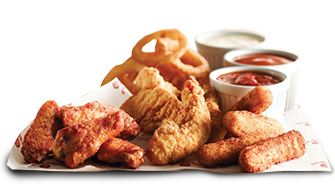 2 chicken wings, 2 cheese sticks, 2 breaded tender chicken breast fillets and onion rings. 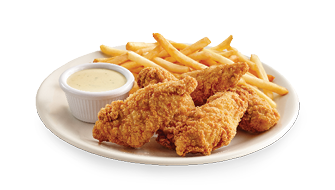 Served with 3 sauces: spicy wing, marinara and honey-Dijon. 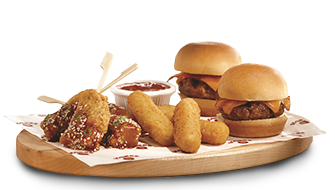 2 miniburgers (topped with bacon, cheese and chipotle sauce), 4 bites of tender General Tao chicken breast fillets and 4 cheese sticks. Served with Scores marinara sauce. 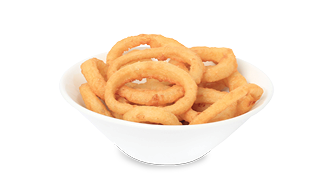 Hot and cripsy onion rings. 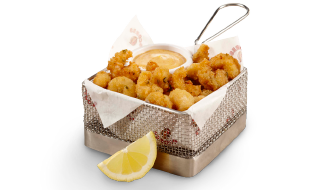 Delicious popcorn shrimp with jalapenos served with our house chipotle pepper sauce. 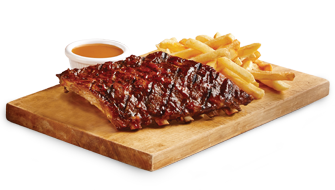 A flavour explosion in your mouth! Delicious marinated and grilled chicken breast pieces. Served on your choice of Scores rice or basmati rice. 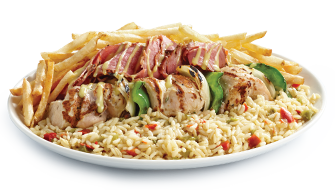 A surprising combination of our marinated chicken pieces with smoked meat covered with a honey mustard sauce. 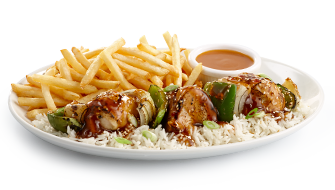 A famous marinated chikcen brochette, grilled and covered with a General Tao sauce. 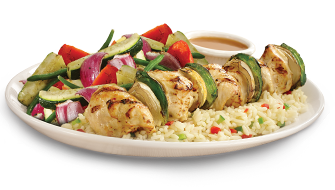 Served on your choice of Scores or basmati rice. 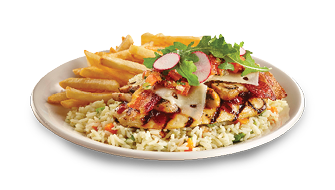 Marinated chicken breast brushed with Scores rib sauce and topped with sautéed mushrooms, crispy bacon, melted Swiss cheese, pico de gallo and a few slightly lemony arugula leaves. Served on your choice of Scores rice or basmati rice. 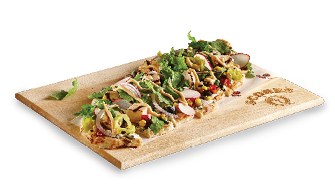 Grilled chicken breast served with sauteed mushrooms, cheddar cheese, fresh salsa (tomatoes, peppers, and onions), crispy onions, and pesto mayonnaise. 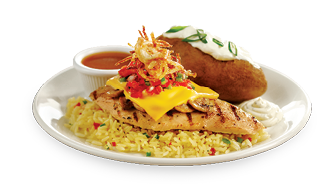 Served on your choice of Scores or basmati rice. 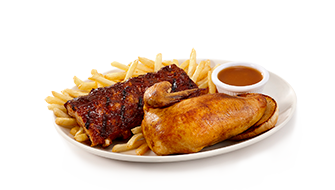 Marinated chicken pieces, grilled and brushed with our Scores ribs sauce, sprinkled with Montreal steak spices and covered in bacon bits. Served on your choice of Scores rice or basmati rice. 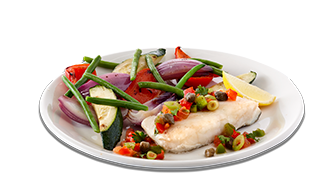 Our best piece of cod cooked en papillote with capers and tomatoes. 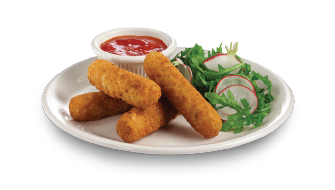 A delicate and savory dish. 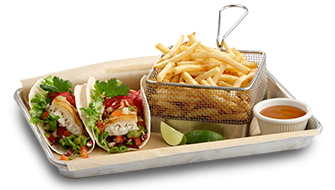 Two tacos with a hearty piece of haddock coated with beer batter, pico de gallo, guacamole and chipotle mayonnaise. 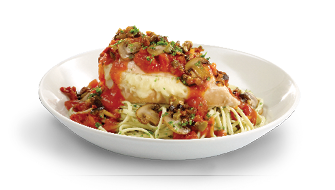 Our delicious rotisserie chicken breast has been revisited the Italian way; an unctuous mix of tomato sauce, mushrooms, olives and mozzarella served with garlic linguini. 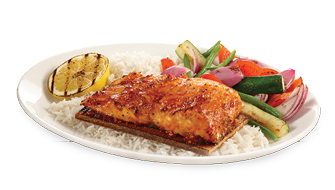 Maple-coated spice-rubbed salmon steak placed on an aromatic cedar plank and cooked on our grill. 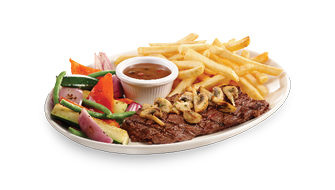 Served with your choice of Scores or basmati rice. 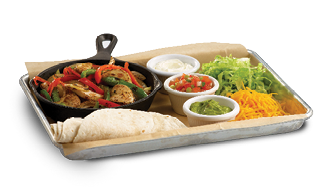 Served with guacamole, fresh salsa (tomatoes, peppers and onions), lettuce, sour cream and shredded cheddar cheese. 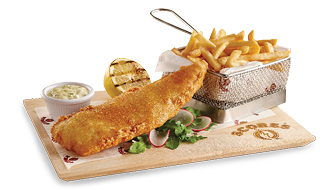 A classic to enjoy: a hearty piece of haddock coated with beer batter, topped with a lemon wedge, and served with tartar sauce. With roasted vegetables, sautéed mushrooms and pepper sauce. Fluffy, hot, naan bread covered with a cheese, spinach and artichoke spread, grilled chicken pieces, and a mixture of corn, peppers, red onions, roasted black beans and peperoncini peppers. Served with our house chipotle pepper sauce and a few slightly lemony arugula leaves. 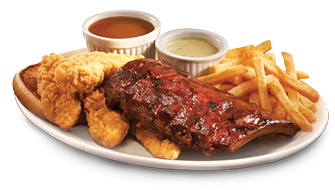 A southern taste on your plate. 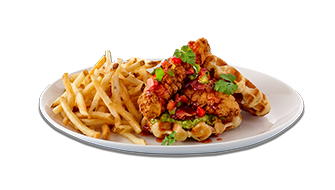 An interesting combination of sweet and salty, garnished with guacamole, enhanced with a spicy note between a Liege waffle. 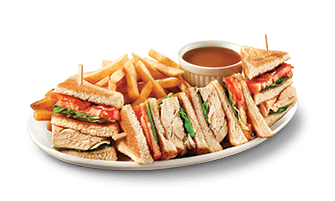 Our generous sandwich is made with a delicious rotisserie chicken breast and bacon, lettuce and tomatoes; served on your choice of whole wheat or white bread. 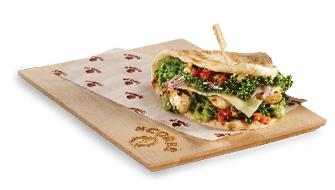 Warm and fluffy naan bread topped with marinated and grilled chicken strips, Swiss Cheese, red onions, pico de gallo and guacamole. 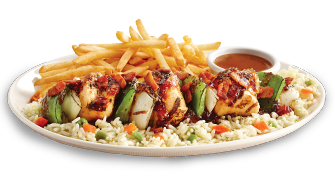 Served with our house chipotle sauce. 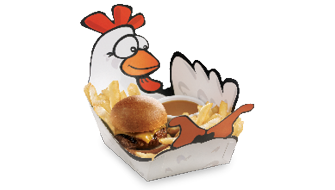 A surprising burger made with our rotisserie chicken leg meat in a rich combination of sriracha sauce and caramelized onions. 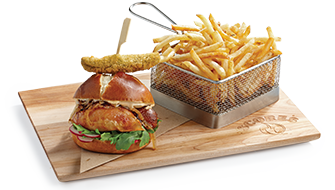 Our famous chicken breast filets served in a pretzel bun, topped with chipotle mayonnaise, guacamole, a mix of black beans, roasted corn, black beans and peppers. 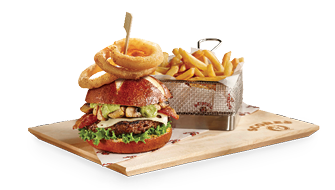 A delicious, tender and juicy 100% beef burger served on a pretzel bun with our onion rings, and garnished with Swiss cheese, onion rings, sautéed mushrooms, crispy bacon, guacamole, lettuce and our house chipotle pepper sauce. 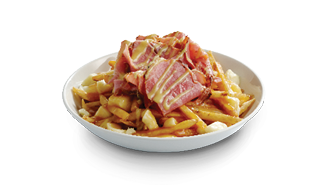 Classic poutine garnished with pieces of our rotisserie chicken. 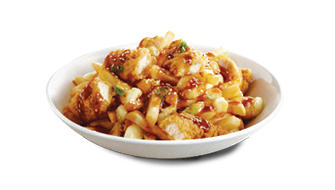 Poutine garnished with pieces of tender chicken breast fillets and covered in General Tao sauce. 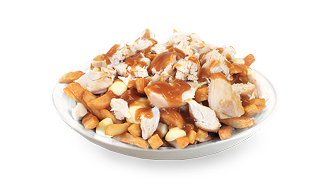 Poutine garnished with pieces of chicken breast fillets and covered with General Tao sauce. 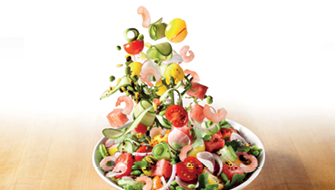 Create your own salad and enjoy it as a meal. 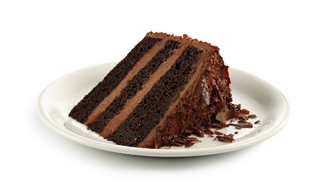 Chocolatery richness taken to the extreme! 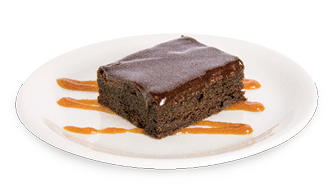 Our brownie is served with ice cream. 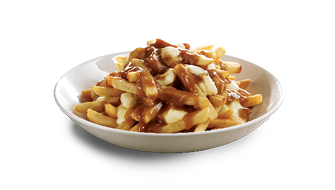 A comforting French-Canadian classic enhanced with warm brown sugar and maple syrup. Add a scoop of ice cream for only $1. 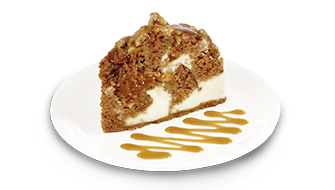 A bold combination of creamy, dreamy cheesecake with and a moist carrot cake on a Graham cracker crust, all drizzled with caramel. 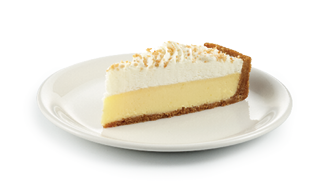 Our traditional pie brimming with fresh lemony filling and topped with whipped cream and coconut. Our delectable pie. Lemony and oh so satisfying! What’s more decadent than a classic molten chocolate cake? 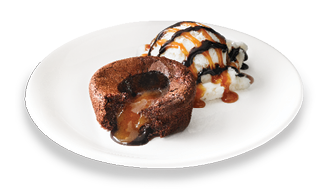 One that is oozing with caramel, and capped off with a great big scoop of ice cream. 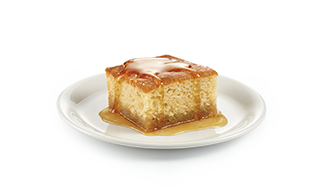 Melt-in-your-mouth magic. 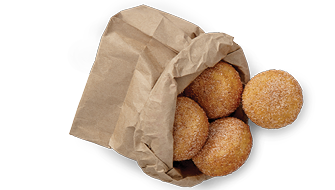 Donuts served warm with a creamy chocolate or caramel sauce. 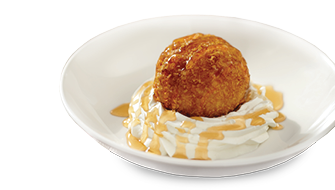 Vanilla ice cream scoop, fried in crispy cornflake coating.Enjoy this dessert, drizzled with a choice of honey or maple syrupon a cloud of whipped cream. Happiness in one scoop! 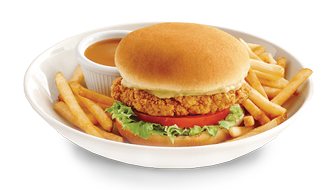 Tender breaded chicken breast fillet, lettuce, tomatoes, honey-mustard sauce, served in a roasted hamburger bun. 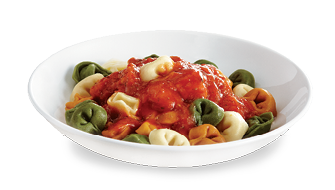 Cheese tricolor tortellini served with tomato sauce. Chicken leg from our grill. 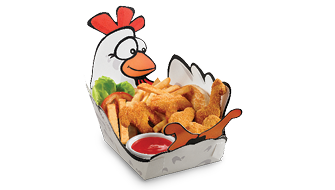 5 fun pieces of breaded chicken in the shape of animals.